Today I show you how to cut an onion without crying. Sick of shedding tears every time you chop an onion? That will be a thing of the past after you’ve watched this tear free onion cutting tutorial. 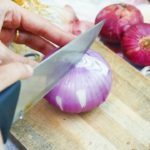 Simply follow the step by step instructions and you’ll successfully be able to cut/chop/dice onions without any pain or suffering – and it’s easier than you may think. This is the exact same method that is used by famous chefs such as Gordon Ramsay & Jamie Oliver on a daily basis.